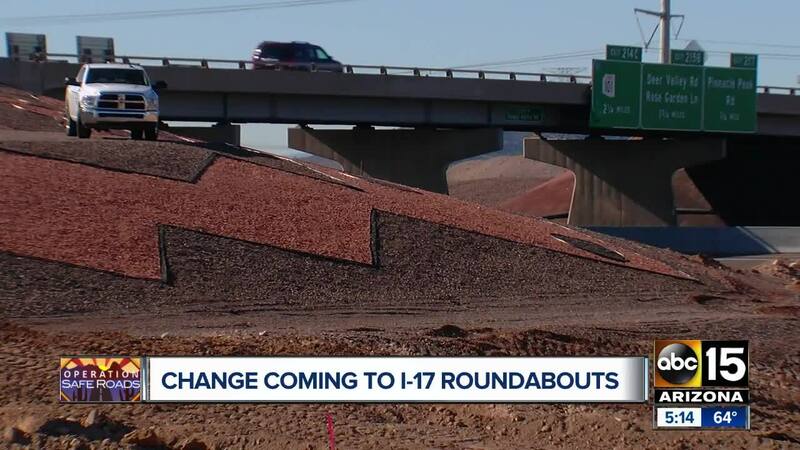 Changes are coming to the I-17 roundabouts, particularly the one at Happy Valley Road after repeated traffic jams at the area. PHOENIX — If you're not used to driving in a roundabout, they can be confusing. Ask Bob Anderson; he lives near the roundabouts on Happy Valley Road near I-17. "The people get on the roundabout, and if they don't know the right of away, you've got an accident," Anderson said. "A lot of them are in a hurry." The two roundabouts on Happy Valley Road and the interchange at Pinnacle Peak Road are going to be replaced with a diamond-shaped interchange which includes wider bridges and traffic lights. Doug Nintzel, a spokesperson for ADOT, said the reconstruction has nothing to do with the popularity, or lack thereof, of this circular design. It's really because the growth in this area of north Phoenix has exploded. "Roundabouts are good options in some areas," Nintzel said. "In this case, traffic doesn't support the roundabout anymore." Nintzel said it'd been a long time coming. Growth in the North Valley has exploded, and engineers predicted the need for wider bridges nearly 20 years ago, but the state did not have the funding to do the work at the time. Starting Saturday night, until Wednesday morning, expect lane restrictions in the overnight hours while crews erect barrier walls. Then beginning Sunday night, about a mile stretch of the southbound HOV lane near the Happy Valley Road exit will be closed for close to a year. "Drivers are going to need to know that they should merge out of that carpool lane approaching the Happy Valley Road area," Nintzel said. Anderson looks forward to the day he can leave Happy Valley Town Center at rush hour and not have to jockey for a spot on the road. "At 5 o'clock if you try to get out of here it's a madhouse," he said. "People do not give the right of way. It's crazy." When the project is done, the current bridge over I-17 will be demolished. Completion is expected in fall of 2020.